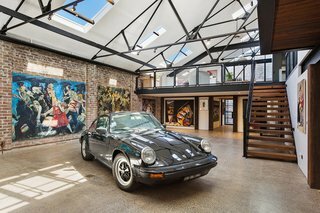 The converted warehouse home and studio of award-winning painter Fred Cress in Annandale, Australia, is up for auction with a guide price of $4,500,000. 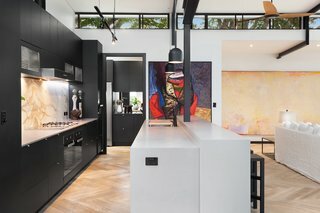 The painter's son, Julian Cress—executive director of the popular, Australian home renovation show The Block—has put the beloved home on the market, as he spends most of his time living and filming in Melbourne. A private rooftop terrace with a Juliet balcony looks down at a gallery space on the ground level. 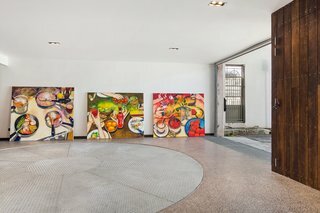 Julian inherited the home after the Archibald Prize-winning artist passed away in 2009; Fred had used the space as a home and studio for over 20 years. The living area on the upper level leads out to a rooftop terrace. Though it was with a heavy heart that Julian made the decision to sell the property, his hope is that "somebody really special will buy it." 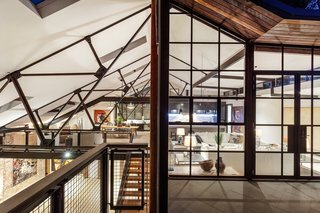 The soaring ceilings are interlaced with timber trusses and exposed steel. 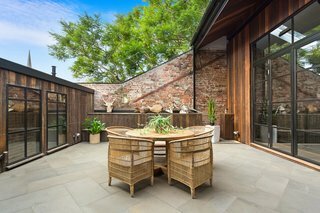 In 2015, Julian worked with his friend and architect Julian Brenchley to revamp the property to such a high standard that it won the Master Builders Association of New South Wales’ Excellence in Housing Award that year. 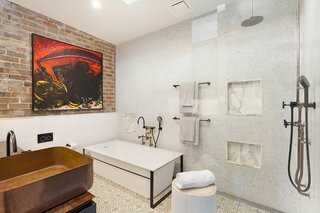 The four-bedroom, three-bathroom house boasts close to 4,984 square feet of cavernous space, 450 square feet of outdoor area, and a four-car garage. The open-plan upper level includes a private rooftop terrace. 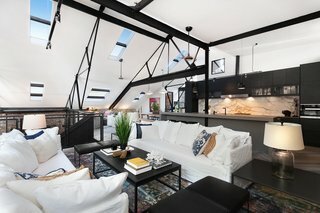 Originally a bus depot and mechanics workshop, the converted live/work warehouse has been transformed into an airy, upscale residence that’s ripe for entertaining. The kitchen includes a generous butler’s pantry with Libeherr refrigerators. 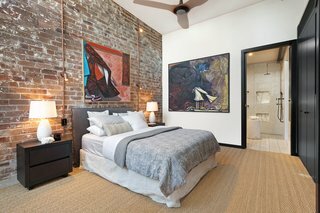 Deferring to the building’s industrial past, the renovation marries pre-war industrial elements with warm, contemporary finishes. The garage is set up like an art gallery. In the four-car garage is a turntable for easy vehical entry and exit. 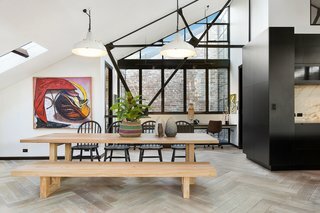 The building’s original exposed brick and steel trusses are beautifully complemented by polished concrete on the ground level, and herringbone pattern timber floors on the upper level. Hand-beaten brass basins and brass plumbing and hardware gleam in the three bathrooms. 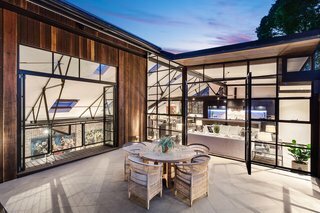 Crittall windows bring in plenty of light. 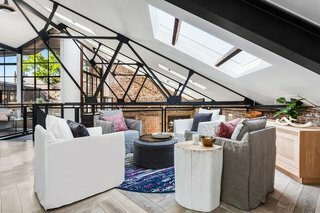 Ten skylights, a courtyard, and a rooftop terrace combine with Crittall doors and clerestory windows to flood the interiors with light, imbuing the high-ceilinged interiors with a cathedral-like grandeur. 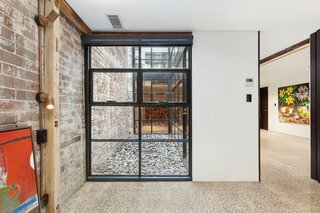 Polished concrete and exposed bricks give the home an industrial look. The extraordinary, modern-industrial property is now available for bids through McGrath. For more information, contact agent Damien West.